People are always asking me how I make my own tofu and I’m always telling people it’s easy and to give it a try. And yes you can always add your own herbs and flavourings in the curd to craft your own schmexy tofu varieties. Awhile back I posted this tutorial, but not everyone has a press or a mould, nor a soy milk machine, so I thought it’d be worth posting a quick tut on how to make your own bean curd without any fancy equipment (in fact I’ve given up using my soy milk maker out of preference for this blender/liquidiser method). This will only make a small quantity, but consider it a jumping off point. You can easily double or triple it later if you decide you want to make more. Soak 1/2 cup of soy beans in 2 cups of water overnight. In the morning skim any gunk off the top of the water and blend the beans and soaking water along with another 1 cup of water. You don’t need a mega liquidiser for this, just something that’ll make a good pulp out of the lot. It will smell rank at this point, but take note of it so you can spot the difference in aroma once heat has been applied. Pour the contents of the blender into a medium saucepan and turn the heat to medium high. Stir constantly while the mixture heats. Once it comes close to boiling, the top will grow foamy and rise. Quickly remove the pan from the heat to stir everything back together again. Heat for a further ten minutes on low heat and you’ll notice that pre-cooked beany smell has disappeared. Be careful not to leave on high heat for too long else everything will curdle and you’ll have to chuck it out and start all over! Meanwhile place a mesh colander over a large bowl and line it with thin muslin. Once you’re finished heating the soy mix, pour it into the fabric and press as much milk through as possible (use a spoon or spatula to help). Add another 1/4 cup of boiling water to the soy pulp and stir through, again pressing out as much as possible. I usually leave it to cool for a few minutes so I can just twist the muslin up and squeeze with my hands. You will be left with what’s known as okara, the by-product of all soy milk and hence tofu production. Pop this in the fridge because you can use it for all sorts of other recipes. Pour the contents of the bowl, your soy milk, into a saucepan and heat until the temperature reaches 180 F.
Mix 1 teaspoon of nigari flakes plus 1/4 tsp gypsum with 2 tablespoons of hot water in a small bowl or cup (you can experiment with using just one or the other coagulant, but this is my preference for taste and texture). Stir until the nigari is dissolved. When the soy milk is hot enough remove it from the heat and stir quickly a few times before pouring the nigari/gypsum/water across the vortex, ensuring you cover as much of the milk as possible. Pop a lid on the pan and leave aside for a good ten minutes for the curds to separate. Sometimes it helps spread the coagulant evenly by lightly agitating the pan a few times. Either get a clean piece of muslin or rinse the one you’ve already using and line the mesh colander once more over the bowl. Check out the curd in the pan; it should look like a big clump of white floating in greenish clear liquid. 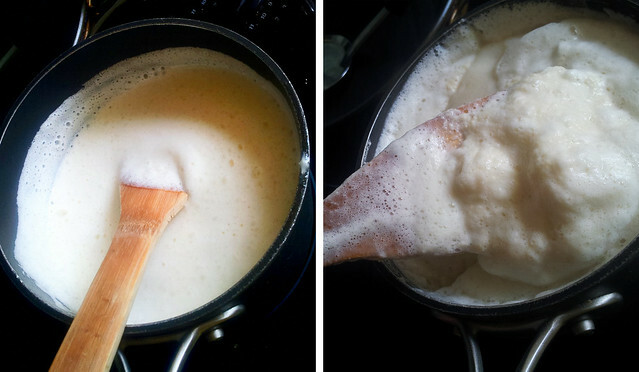 If it still looks opaque and milky then try applying some more heat to the pan and gently agitate it again. Carefully pour everything into the muslin. Tilt the colander from side to side to let as much of the whey pour through as possible but do not stir the curd or use utensils to press liquid out. You can do one of two things here: either ball the muslin up as tight as you can, wrap it equally tight in a tea towel, and press it with a heavy object or five (like books), or mould it. Because the former method is pretty self explanatory I opted to do the latter for this tutorial. Find a small (and I mean small – no more than 4-5 inches square for one batch) tupperware container and line it with a tea towel. Set the muslin on top of the tea towel and carefully distribute the curd to lie flat in the container (you can use your fingers or a spoon). Fold the muslin over the curd so it covers the container evenly. Fold another tea towel over this and place a heavy object(s) on top to press. The amount of time you leave this depends on how firm you want your tofu, so you’ll need to experiment! And that’s it! Once you remove the weight and towels, unfold the muslin to find your very own home crafted tofu! I totally want to try this. You make it look doable! Thanks for sharing your awesome detailed pictures and steps. Amazing Kip! I can’t wait to try this one day! This looks awesome! Where does one get nigari or gypsum? And can you use frozen soybeans? Gypsum is used a lot in beer making, so artisan kitchen shop type places might be able to help you out. Nigari can be ordered online or found in specialist Japanese stores (maybe). As Helen pointed out in another comment, you can also use epsom salts! Another helpful tip, especially if you have a soy milk machine is to soak and then freeze the soy beans, and then use them from frozen. Makes the whole process a little more spontanous. Great post! 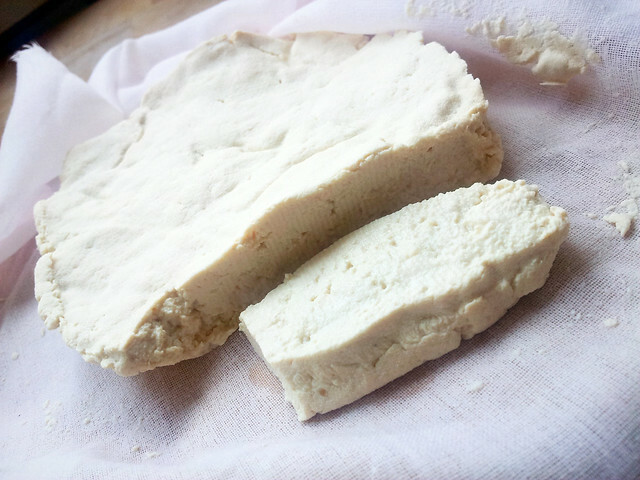 Homemade tofu is the best thing ever, I like it with a drizzle of olive oil when it is still warm. You can also use epsom salts to coagulate the milk, get them from any pharmacy. Thanks Helen! I’m always trying to get people to try making it, just to experience that unique flavour and texture that’s completely lost with the packaged stuff. Can you get epsom salts in UK pharmacies do you know? I’ve read about being able to use that and a few other coagulants but haven’t personally tried them. What’s the yield like? I just epsom salts all the time for my tofu, with one batch in the machine I get enough for 2 for a main course. Also vinegar and lemon juice should work too. Epsom salts are for sale over the counter in any pharmacy. You do not need gypsum, I think it slightly changes the texture, although it is great to add if you are worried about calcium intake. I found vinegar and lemon juice too grainy. My preference is all nigari but gypsum grants a greater yield and a chewier texture when deep fried (my second favourite food group next to candy floss). I’m going to have to find some epsom salts, cheers! I can’t find a good online source for nigari or gypsum. Can anyone point me in the right direction? Looks really tasty – where do you buy your soya beans from? I’ve always been a bit scared of them because of all the warnings about not eating raw beans, but you make it seem really straightforward. I bought a 25 kilo bag a year or so ago and I don’t remember where I got it! My only prerequisite with buying soy beans is organic, but that’s just because soy is so landrapey. The smell of the beans raw when you first blend them is repulsive, and at that point you know it’s not digestible. It’s pretty easy to notice once that’s gone because that smell disappears after enough heat has been applied and it starts smelling almost sweet instead. If you taste a tiny bit and it still has a beany flavour at all, just apply some more heat. Wow! That is super neat. I’ve always wanted to try making my own tofu. This is a great tutorial. Some articles I checked said the soy bean has to be dehusked, but that is a very tedious task. Is there any quick way of dehusking the soy beans if one must do that? I find it always tedious and never do it! Yesterday, I tried to produce silken tofu but I ended up with the regular one. Well, it was the first time for me to make tofu. it was kind of a spontaneous action n the middle of the holiday season. In total, I tried to turn about 5 batches of soymilk (0.5l to 1l) into silken tofu, but it always looked flaky like your stuff. Since all the stores were closed, I decided to use vinegar or lemon juice as a coagulant, rather than calcium sulfate (gypsum), magnesium sulfate (Epsom Salt) or magnesium chloride (Nigari). Did you ever try to make silken tofu? What is the trick that it’ll work? I guess it’s the temperature as well as the soybean-water ratio – on internet recipes I found everything from 3 cups (~500g) dried soybeans with 2l of water up to about 6l of water. Most were around 3l, yours is 4.2l minus the soaked water for 3 cups of beans. In order to make silken tofu you have to use a coagulant that does not cause the soy milk to separate into curds and whey, which lemon juice and vinegar will almost inevitably do. Silken tofu isn’t pressed in any way, so a rich and fatty soy milk is added to a container (i.e. the same container the product would be sold in) and the coagulant is added. Gypsum is probably the easiest ingredient to source, but glucono delta lactone is used sometimes as well (especially in commercial products). In Japan gypsum seems to be the coagulant of choice for silken tofu. I’d go with about 1/2 teaspoon gypsum per 250 ml soy milk, but remember the soy milk needs to be high fat (at a guess, about 150 grams dried soy beans per 450 ml water). Hi, I only recently started making my own tofu (two batches so far), and while it’s generally working, I still have some small problems. I can’t help wondering if I shouldn’t be getting more tofu and less okara out of it. Technically I don’t mind the okara, I just eat that stuff, too (I used the leftover from the first batch to make your okara okonomiyaki, which was great, btw, thanx so much for that idea!) But somehow I always get more okara than tofu out of the recipe. Is that right? How much tofu and okara do you end up with? Am I not blending enough? Is the cloth I use for straining not right? In case you got any ideas how I could improve this, I’d be really grateful! Thank you for the great blog!! Hi Nat, this is a really good question. I haven’t measured the exact quantities of each that are yielded from the process, but you are correct that there is a higher quantity of okara than tofu. One thing that can add to a higher yield of tofu is to press the okara a second time after mixing with hot water. This is similar to the step where I suggest pouring an additional 1/4 boiling water over the okara. The more fatty soymilk you can get out of the beans, the greater your tofu yield will be. But this will still leave you with a lot of okara! Hope that helps.